Up for sale is a 32-Channel METRUM RSR 512 Portable Recorder Reproducer Precision Voltage Recorder. Cavlon Item # 2659. Raw weight each 70. Lbs. and dimensions 23x18x11". Up for sale is a Ballantine 323 True RMS AC Voltmeter Analog. Cavlon Item # 2019. Up for sale is a Voltage display meter that will display the battery state of charge up to 50MV. Cavlon Item # 1544. 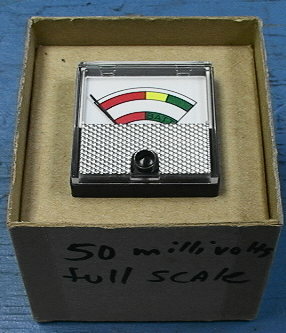 Dimensions: 3"x3.5"x3.5"
For sale is a General Electric AC Volt Analog Meter Gauge 300V Model # 103021RXRX/UL. Cavlon Item # 2997. Raw weight is 2 lbs. Raw dimensions are 6*4.5*4.5. Up for sale is a General Electric Kilowatt Hours Meter. Cavlon Item # 2903. Up for sale is a Hewlett-Packard HP 8405A Vector Voltmeter. Cavlon Item # 945. Raw shipping weight is 29.5 lbs. Raw dimensions are 19*18*7. Up for sale is a IOtech DBK11 Screw Terminal Expansion Card with DBK30 Battery Module. Cavlon Item # 994. Up for sale is a Philco Sierra Electronics Model 128A Frequency Selective Voltmeter. Cavlon Item # 1316. Up for sale is a Schlumberger Multifunction Polyphase Meter Two Stator WattHour Meter 55FQ with LCD display . Cavlon Item # 903.